It’s that spring ritual for me. If it isn’t asparagus, it’s ramps. If it isn’t ramps, it’s morel mushrooms. And, when they are done, it becomes garlic scapes. Etc. Etc. I post every year about those fleeting specialties that grace our table in all their glory. Ramps, last year, for example. That post also mentions the fresh morels from Jenny’s Market. Yesterday when I saw the signs on route 32 for the market, they highlighted the seasonal goodies like the mushrooms. I have also written many posts on asparagus, and on garlic scapes, but today I want to show another simple preparation with the ramps that were still available at the Silver Spring farmer’s market. I found a recipe in Laurie Lundy’s amazing book on Appalachia. The book is called Victuals, pronounced viddles, according to the introduction. I also grew up hearing it pronounced at vittles. No matter, it is a very complete collection of recipes and their history in the Appalachian communities. I ended up using her guidelines for ratios, but using what I had in the pantry. 4-5 ounces of ramp leaves. Three large bulbs. I blanched the leaves. Wrung them out after their ice water bath. Put them and the bulbs in the food processor with about 1/2 cup of pistachios. Added 1/3 cup of Parmesan cheese. Poured in the olive oil while watching it emulsify. A little salt and pepper to taste. 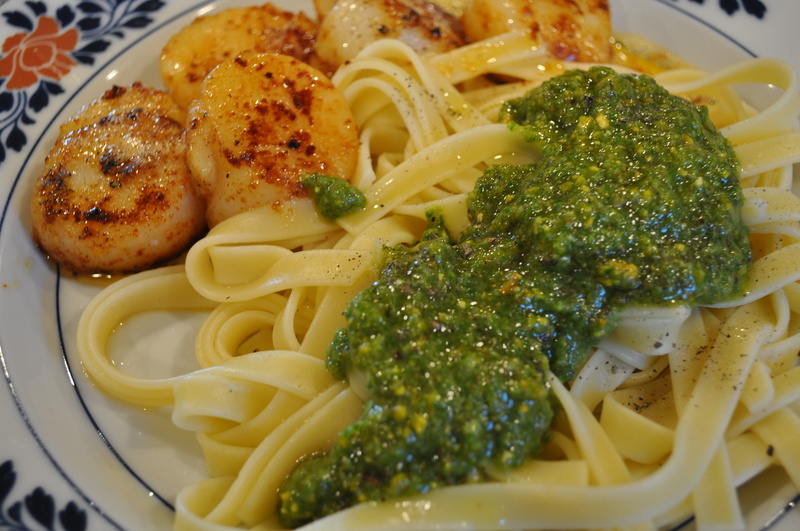 I used this pesto on pasta, and on flatbreads. Added it to an omelet with sautéed potatoes. Put a little on a freshly baked potato. I made it twice already in the past two weeks. Ramp season is fleeting. They are wild, and not agreeable to cultivating. An interesting fact I recently heard on the newest Parts Unknown. The West Virginia episode that premiered last week. The farmers in West Virginia are paid $2 a pound for ramps that are taken to New York City where they fetch up to $32 a pound. Talk about a markup! We pay about $4 a bunch to the West Virginia farmers who frequent the Silver Spring market. Those bunches weigh about 5-6 ounces so they are getting around $12 a pound by selling direct to customers here. A big difference in price. If you get the opportunity to buy from the local communities, they do far better than selling through distributors. Now, I just need to head up to Jenny’s and get some locally sourced morels. Posted in Community, cookbooks, Farmer's Markets, Farms, Food, Foraging, Locavore, Real Food and tagged cooking, farmer's markets, Food, foodie, Locavore, ramps, real food. Bookmark the permalink.